Brad’s neighbor Nancy Wells has a story about how Ben & Jerry’s sweetened the vacations she took with her Boston friends in the early 1990s: “We’d rent a cabin together for a long weekend and split the cost, because back then none of us had any money. But there was one non-negotiable condition. We had to call around first and find a place that had a full-sized refrigerator. The freezer had to be big enough to hold a two-and-a-half-gallon tub of ice cream. Nancy’s photos show Pamela Dibona and Adam Gerberick impersonating Ben and Jerry while visiting Waterbury, and Susan Brager enjoying Fred’s Famous on the front porch of their cabin while Adam eats his on the porch. Fred’s Famous was named for Fred “Chico” Lager, the CEO of Ben & Jerry’s until 1991 and a board member until 1997. By the way, Chico is a good writer, and he took notes, too. 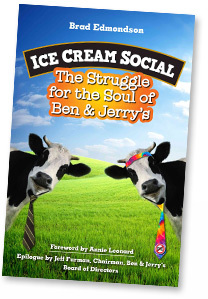 His highly detailed and entertaining memoir, Ben & Jerry’s: The Inside Scoop, was published in 1994. Do you have a Ben & Jerry’s story? Please share it with us!